4 VIE is the 4 way lift truck that represents the most specific solution for moving long pieces (bundles of bars, pipes, sections, etc.) inside narrow corridors and aisles. With 4 VIE , the operator simply has to set the lift truck desired direction, frontal or lateral, thus being able to store or pick up even very bulky loads. By means of a simple distributor control, it is possible to modify the direction of the wheels with respect to the forks; thanks to this 90° rotation, it is possible to vary the lift truck direction from frontal to lateral, allowing the movement of bulky loads even in narrow aisles. 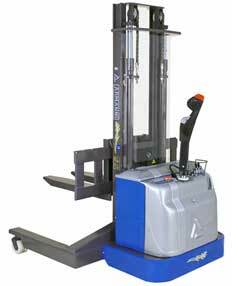 The double parallel lifting pistons ensure perfect visibility of the forks and an easy hold of the pallet. The mast with special steel profiles assures excellent structural performance also even in the case of usual and continuous movement of heavy loads.